I loved taking summer road trips when I was a kid. My parents would be in the front seat of our Country Squire station wagon, blasting A/M radio while my sisters and I did pretty much anything we wanted to do in the back of the car. And I don’t mean the “back seat” of the car, I mean “the back.” Because those were the days before ridiculous things like “car seats” and “highway safety” came about, so we pretty much had the entire car at our disposal. One year my mother even folded down the seats and installed floral cushions and curtains so we could lie down and take naps while we zoomed down the interstate. Oh, the freewheeling 70’s—how I miss you. Okay, I don’t really miss the 70’s, but now that I’m facing a very long road trip with my husband and two sons this summer, the thought of free-range kids who aren’t stuck whining in their car seats is quite appealing to me. However, that’s neither smart nor legal, so instead I’ve come up with some activities to keep us entertained as we enjoy each other’s company for 3,000 miles. Three thousand long, long, loooong miles. Have a DVD player installed in your car? Then you’re golden, my friend. Simply bring along a stack of movies that’ll keep the kids entertained for miles. But if, like us, you don’t have a DVD player in your car because you think “it’s better for kids to look out the window” (read: too cheap to install one), see if you can borrow a portable player from a friend. Or do what we do and download a few movies and TV shows on the kids’ iTouches or similar devices. That way also prevents arguments over the choice of movie because they each have their own to watch. Although my kids only get an hour of video games a day when we’re at home, that rule goes out the window if we’re traveling. Video games are something they love to do and it keeps them occupied for a couple of hours so my husband and I can have uninterrupted map fights. So whether your kids have a DSi, a PSP or a Leapster, make sure you pack plenty of game cartridges, headphones and extra batteries. Of course, some or all of those items will eventually wind up stuck under your seats, but that comes with the territory. The first person says a word with only three letters, such as “met” and the next person has to say a three letter word that begins with the last letter of the word given. So if you start with “met” the next person could say “tea.” Fun and challenging. We also bring along the book “Miles of Smiles: 101 Great Car Games and Activities” that has a lot of really great things to do. On our last big car trip, we planned a few stops in advance, but we also played it by ear a little, too. If you happen to be driving through a stretch of really pretty scenery, why not pull over and take in the view for a few minutes? Kids always love to get out of the car and it’s a good photo opp. Another road trip activity idea I’ve stolen from my parents is “The Prize Pack.” Basically the PP is just a bag filled with used books, candy and items from the Dollar Store. I usually whip this out every few hours or so when the kids have been well-behaved and let them stick their hands inside to grab a prize. The items they get aren’t that great, but they absolutely love it. Plus I can use it as leverage when they’re acting up. I think reading is hands-down the best activity kids can do during car trips. Before we head out, my boys and I always take a special trip to the bookstore to pick out a few new books they’re excited to bring along. They also love activity books like Mad Libs and the “National Geographic Kids Ultimate U.S. Road Trip Atlas: Maps, Games, Activities, and More for Hours of Backseat Fun” that are a little more interactive. The only caveat about kids reading in the car is that it may make them nauseous, like it does my son Sam. Be sure you remind them to look up every ten minutes or so because the last thing you want on a car trip is someone to get car sick. Or at least that’s what my mother used to yell at us when we were rolling around in the back of the station wagon. 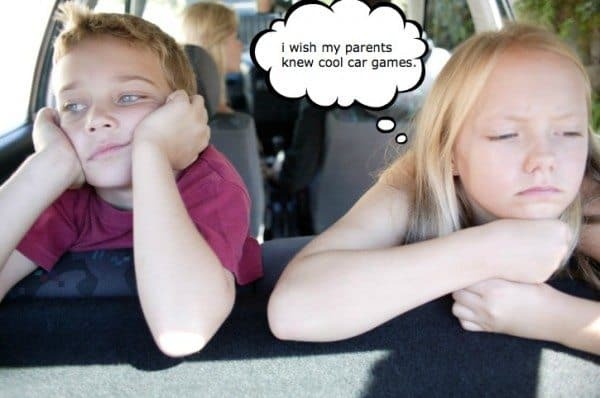 What do you do to keep the kids occupied on car trips? Someone? More ideas please! About to go on a trip with a two year old…. electronics…….. mad libs…………. tic tac toe………………….. oh oh oh!!! lollipops!! they will last a long time….. lots of water not too much though…….. ect…. look on six sisters they have awesome ideas!!!!!! !